Warm weather throughout the year, endless recreation opportunities, world-class beach scenery, and amazing cuisine are just a few reasons Destin is such a hit with adults. There is something to do for everyone. While adults can certainly have an unforgettable time in Destin, this Florida destination is just as appealing for kids. That makes Destin a great place for families to enjoy a memorable vacation, as these three reasons more than prove. Repeat visitors and locals alike will tell you that Crab Island is perhaps one of the most unique and most exciting attractions in all of Destin. Not exactly an island, this spot is a submerged sandbar where the water is shallow and the sun is shining. Easily accessible from the coast, Crab Island is a huge hit with all ages. You can arrive by kayak or by paddleboard, but most visitors come by boat. Charter a boat and head out to enjoy all that is available at Crab Island, including the magnificent view. 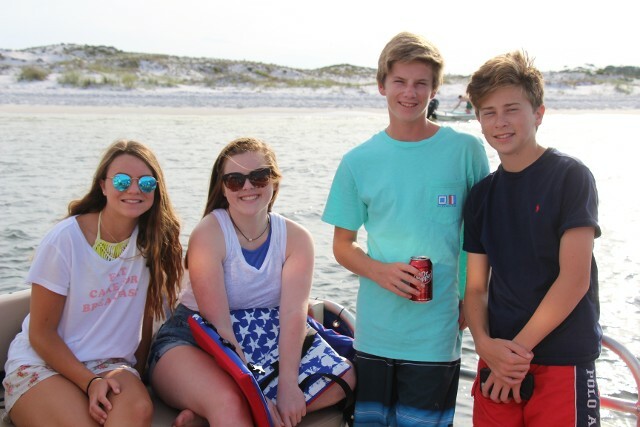 Crab Island is a gathering place, and you’ll have little trouble making new friends. Floating vendors sells food, drinks, and ice cream and there’s even a water-based obstacle course where kids can get wild and make a splash! A big part of enjoying a great vacation is finding fantastic food. Unfortunately, some destinations aren't especially accommodating to younger visitors. Sometimes, families struggle between fine dining where children are unhappy or casual fare where the cuisine is anything but exciting. In Destin, there is no reason to choose. That’s because you can easily get both at the same time. Part of Destin's beachside charm is having all kinds of waterfront dining options. At Boshamps Oyster Bar, you can grab a table overlooking the beach. As the kids fish off the dock with provided poles, try out beach volleyball or kick back in a hammock. When it’s time to eat, the kids can dig into cheeseburger or chicken fingers and the adults can enjoy delicious oysters or perfectly grilled steaks. At Fudpucker's Beachside Bar & Grill, you can order a round of cocktails and enjoy delicious seafood while the kids have the time of their lives. The restaurant offers lots of games and activities for the younger crowd, and there is even an alligator exhibit right on the premises. There are plenty of watersports each family member can enjoy and there is always that beautiful Destin beach. But, imagine a way to spend the day surrounded by the people you care most about—minus the crowds— and on the water with all the amenities you could desire. Does that sound too good to be true? It's not if you charter a double-decker pontoon boat to explore Destin! A double-decker pontoon boat is big enough to fit the entire family and even a few more friends. There is plenty of shade if necessary, and you can bring along coolers to enjoy cold drinks and snacks all day long. Bring the gear you need to fish from the boat or snorkel. You can probably even spot some dolphins in your wake. The right double-decker design also means there are two waterslides for the small and big kids to enjoy. Clearly, Destin is a winning destination for families on vacation. If a double-decker pontoon boat is your pick for day on the water in Destin, Double Fun Watersports is your go to Destin boat charter. We’ve got the best double-decker pontoon boats in town and we’ll be glad to help you plan the ultimate family vacation in Destin, Florida with the charter of a new double-decker pontoon boat with two waterslides!